In 1956, B-29 s/n 44-69972 was among 50 Superfortresses that were parked in the desert at China Lake. They were to meet an ignominious end as targets for ballistic missiles; however, luck spared a plane named DOC that was all but forgotten. 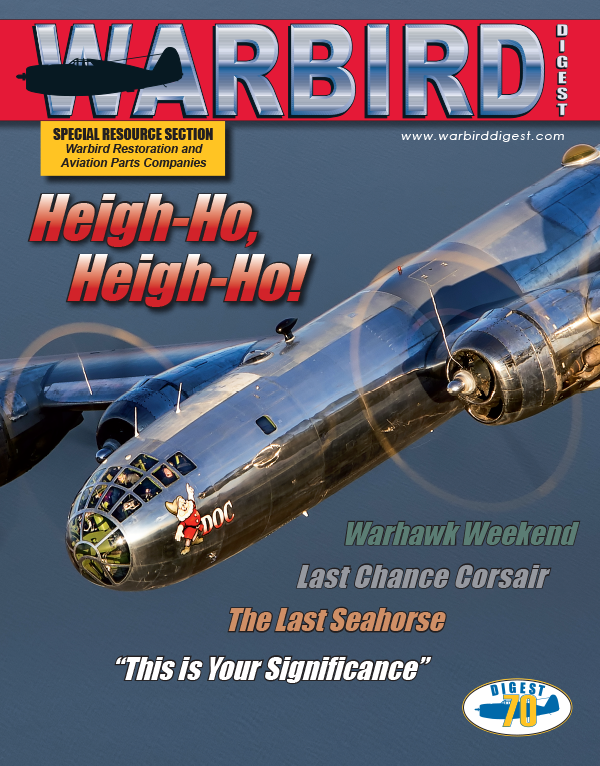 When Tony Mazzolini decided to search for a B-29 to restore to flying status in 1987, everyone told him there were none left, until he heard about DOC. This is the story of the three-decade odyssey that culminated in DOC returning to the skies. One of the oldest flying Corsairs in the world is F4U-1A BuNo 17799, based at the Planes of Fame (POF) Museum in Chino, California. For many years, museum of ficials have suspected the Corsair had seen combat in World War II, but never found documented proof, until author Michele Spry interviewed a Corsair pilot for a children’ s book. Spry’s research revealed three living Marine pilots who flew the POF Corsair in combat. Spry and Planes of Fame Museum sought to reunite these heroes with their plane. In 1988, the Southern California (SoCal) Wing of the Commemorative Air Force (CAF) acquired what is believed to be the last surviving PBJ. It took 23 years, but on May 15, 2016, PBJ-1J BuNo 35857 was ready to grace the skies once more. This amazing story includes not only the monumental restoration effort but also the history of the Marine Corps unit it now represents, and its special connection to a SoCal Wing member. As the number of World War II veterans dwindle day-by-day, warbird events that reunite veterans and the aircraft of their youth become increasingly special. In September 2016, the CAF Dixie Wing hosted a gathering of Curtiss P-40s and World War II veterans, to pay tribute to the men who trained and fought in the mighty Warhawk. On October 25, 2016, the aviation community lost one of the most extraordinary aviators in American history, Robert A. “Bob” Hoover. In the course of his life, Bob Hoover was a combat pilot, prisoner -of-war, test pilot, businessman, airshow pilot, and true gentlemen. Shortly after his death, some of the biggest names in aviation descended upon Clay Lacy Aviation in Van Nuys, California, to celebrate the life of a gifted pilot and patriot.